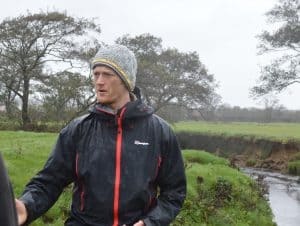 Nov 2017 – In November Gareth Pedley from the Wild Trout Trust, UK visited Inishowen for an advisory visit of the Culdaff River. This was an excellent opportunity to walk along the entire river and hear insights from an expert. Gareth has now prepared a documented report on the current status of the river and banks with recommendations for the future. This has been sent to the Culdaff Anglers who have already carried out many restorative and enhancing works to the river. The Inishowen Rivers Trust recently took part in the One Million Trees in One Day initiative, a project of the Forestry Foundation, supported by the Woodland Trust. This ambitious project aims to plant one million trees in 24 hours across the whole of Ireland. The Inishowen Rivers Trust purchased some trees for the event and offered these to community groups in Moville to plant on Feb 11th 2017.